Thai Airways is considering further capacity cuts following a dismal 2014 when passenger numbers dropped by 17%. RPKs and load factors were down significantly across all regions with the domestic and regional international performance particularly weak as LCC competition intensified. Thai has faced very challenging market conditions as international demand in Thailand plummeted due to a prolonged period of civil unrest, leading to a 7% drop in visitor arrivals in 2014. But it also faces long-term internal structural issues which can only be addressed through a major restructuring. LCC competition in Thailand will continue to intensify in 2015. Thai’s share of the domestic and international markets slipped significantly in 2014 and will drop further in 2015 with LCCs filling most of the void. Thai Airways passenger numbers were down 17.4% to 17.759 million, its lowest level since 2004. Thai’s annual passenger numbers had increased for three consecutive years, from 2010 to 2013, and surpassed the 20 million mark for the first time in 2012. Thai’s RPKs were down 11.2% to 56.377 billion as ASKs decreased by 4.7%, resulting in a 5.1ppts drop in load factor to only 69%. 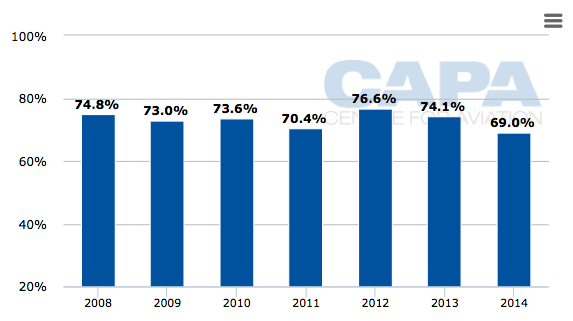 It marks the first time in at least 10 years that Thai’s load factor ended the year under the 70% mark. These figures include regional subsidiary Thai Smile and charter flights. Mainline scheduled RPKs dropped 11% from 62.018 billion RPKs in 2013 to 55.186 billion RPKs in 2014. Thai’s load factor slipped across all six of its geographic segments. The domestic and regional segments performed particularly poorly. Thai also posted a very poor load factor of 57.3% on African routes. Thai had just one route to Africa in 2014, a three times weekly Bangkok-Johannesburg service, which it suspended in mid-Jan-2015. Thai decided in late 2014 to cut South Africa and also cancelled the planned launch of services to Dusseldorf – two initial moves ahead of an anticipated wider network restructuring. With Dusseldorf Thai may be trying to carve out a niche as unlike Frankfurt, where Thai competes with Lufthansa, Dusseldorf is currently not served non-stop by any carrier from Bangkok. Dusseldorf currently only has two non-stop links to Asia, Beijing with Air China and Tokyo with All Nippon Airways, but Etihad, Emirates and Turkish all offer competitive one-stop connections to Bangkok. The decision to expand the European network despite the recent challenges is not logical as any new long-haul route has significant start-up costs. Thai should be cutting European capacity and its network as part of its restructuring rather than experimenting with new destinations. Thai currently has 13 destinations in Europe, giving it the largest European network among Southeast Asian carriers. Thai’s European RPKs were down a relatively modest 6.5% in 2014 to 20.192 billion. Europe accounted for 36% of Thai’s RPKs in 2014 compared to 34% in 2013. Thai’s load factor on European routes dropped 4.9 ppts to 69.6% as capacity levels were maintained. European visitor numbers to Thailand were down a relatively modest 2% in 2014, an indication Thai lost market share despite maintaining capacity. An adjustment to Thai’s European network is overdue. Thai has struggled to compete in the Thailand-Europe market as Gulf carriers have steadily added capacity to Bangkok. Thai also now faces LCC competition from Norwegian on three of its European routes – Copenhagen, Oslo and Stockholm. As CAPA previously outlined, most of the capacity cuts implemented by Thai came in the regional market. Thai cut ASK levels in early 2014 by about 5%, driven by about a 10% reduction in regional international flights. Thai initially hoped to restore this capacity in early 3Q2014 but ended up maintaining the cuts for most of the year as demand was slow to recover. Visitor arrivals from Asia were down 8% for the full year to 17.3 million. Thai Airways operated 638 international flights per week in summer 2014 compared to 588 weekly flights in summer 2013. Seat capacity was down 8% to 362,484 weekly seats. Most of this reduction was within Asia-Pacific as Thai maintained long-haul capacity, which consists almost entirely of Europe as its North Pacific operation is limited to four weekly flights to Los Angeles via Seoul. Thai also cut its domestic operation with weekly seats down 28% to 88,016 seats in its northern summer 2014 schedule. But this was partially offset by expansion at Thai Smile, which has taken over several domestic routes. The poor performance in the regional market was mostly driven by the very unfavourable market conditions. Asians are generally more likely than Europeans to alter or cancel holiday plans because of civil unrest. Passengers from other Asian countries also typically book much later because Thailand can be a last minute short getaway option while visitors from Europe generally stay for longer. The regional international market started to recover in late 2014, giving hope for a brighter outlook in 2015. But Thai should not limit its network review to the long-haul operation. While Thailand’s international market should recover in 2015, competition with LCCs is intensifying significantly. LCCs will likely capture a large share of those Asian passengers that return to Thailand in 2015 after staying away in 2014. LCCs were already able to gain ground on Thai Airways in 2014 as international LCC traffic in Thailand was up by almost 10% despite the overall reduction in visitor numbers. LCCs have had a huge impact on Thai Airways over the last decade as they have quickly expanded in Thailand from a base of virtually zero. But LCCs so far have focused mainly on the domestic market, where they again made significant inroads in 2014 by recording an over 30% increase in domestic passenger traffic. LCCs are only now starting to penetrate some key international markets, particularly in North Asia. As a result Thai faces potentially further declines in its passenger numbers. The 17.759 million passengers Thai carried in 2014 is almost identical to the 17.856 million passengers Thai transported in 2005, which is the last time it was below the 18 million mark. As a result Thai’s passenger numbers have been flat over the last decade. LCCs meanwhile have expanded from accounting for less than 2 million passengers in Thailand in 2004 to nearly 30 million passengers in 2014. Thai is hardly the only flag carrier in Southeast Asia to feel the sting of LCCs, which have dominated the growth across the region over the last decade. Singapore Airlines (SIA) has similarly not been able to grow passenger numbers as LCCs grew their market share in Singapore from virtually zero to over 30%. But SIA has been able to stay profitable by focusing on the premium end of the market. SIA is also now well placed to participate in the growth at the bottom end of the market as it has launched a long-haul low-cost subsidiary in Scoot and expanded its investment in short-haul LCC Tigerair from affiliate to subsidiary. Thai ultimately will need to relook at its multi-brand model as it currently only has about a 39% stake in short-haul LCC Nok Air. It only has an indirect stake of approximately 20% in long-haul LCC start-up NokScoot, which is a joint venture between Nok and Scoot. Thai Airways launched in Jul-2012 a new airline subsidiary in Thai Smile, which was originally intended as an LCC but evolved into a full-service regional carrier following the model of SIA’s SilkAir. Thai Smile has helped the group minimise losses in the domestic market and some regional international routes as LCC competition has intensified. But Thai Smile’s cost structure while lower than Thai Airways mainline is too high to compete effectively against LCCs. Thai Airways has struggled to find a role for Thai Smile, adjusting its network and product strategy several times over the last three years. The latest of several U-turns came in 2H2014 as Thai’s military-appointed executive team decided to move Thai Smile from Thai Airways’ hub at Bangkok Suvarnabhumi to Bangkok Don Mueang, a closer-in airport used almost entirely by LCCs. Thai Smile shifted three of its domestic routes to Don Mueang in Aug-2014 and was initially planning to move the rest of its operation. But Thai reversed course and halted the move of Thai Smile’s remaining routes. Thai Smile still currently operates 10 daily flights at Don Mueang across three domestic routes. But the bulk of its operation is still at Suvarnabhumi, where it operates 15 routes (nine international and six domestic). As only a couple of these routes are also operated by Thai Airways a shift to Don Mueang was always illogical as it would have killed connections. Maintaining connections to the three destinations Thai Smile now serves from Don Mueang is not as essential because Thai Airways serves these destinations from Suvarnabhumi. But splitting the Thai Smile operation between two Bangkok airports is costly and ill-advised. Thai Smile should be focusing on feeding Thai Airways while the group uses its affiliate Nok to compete with LCCs in the point to point market. Thai Smile’s role will almost certainly evolve again as the group looks to restructure its network in 2015. A clearer multi-brand strategy with a higher level of involvement in Nok and NokScoot should be a priority for the new executive team, led by new president and former Stock Exchange of Thailand head Charamporn Jotikasthira. Thai’s 2014 performance was clearly impacted by a prolonged period of civil unrest and political instability. But Thai also has a myriad of long-term issues – both internal and external – that it failed to address in prior restructurings. Thai has now been in the red three out of the four years, including 2014. Thai has not yet reported full year figures for 2014 but incurred losses of THB9.177 billion (USD284 million) through the first three quarters and is expected to post its largest annual loss in several years. Thailand’s new military government, which took over in a coup in May-2014, promised to quickly reform and revamp the flag carrier but has so far failed to deliver. The government and the interim executive team it initially appointed, led by a former air force chief, made several strategic U-turns in the first few months while the airline continued to flounder. Thai needs stability and a clear strategy. The challenges Mr Charamporn inherits are huge. But there will be opportunities as the Thai market stabilises and resumes rapid growth. Thai should be able to chart a sustainable future under the right leadership and as long as the government, which continues to own a major stake in the flag carrier, refrains from meddling. History suggests this is a hopeful scenario, but will be essential for the flag carrier's long term health. The worst thing the government could do is to increase regulatory protection for Thai, for example introducing silly and counterproductive price controls as the Indonesian government has done. That would simply allow Thai Airways to continue to flounder, while its LCC and major long-haul competitors become increasingly powerful.